While every kid at one point may dream of running away from their parents, "the idea of running away, in reality, is not a romantic thing at all," says Marvel Television president and Runaways executive producer Jeph Loeb. 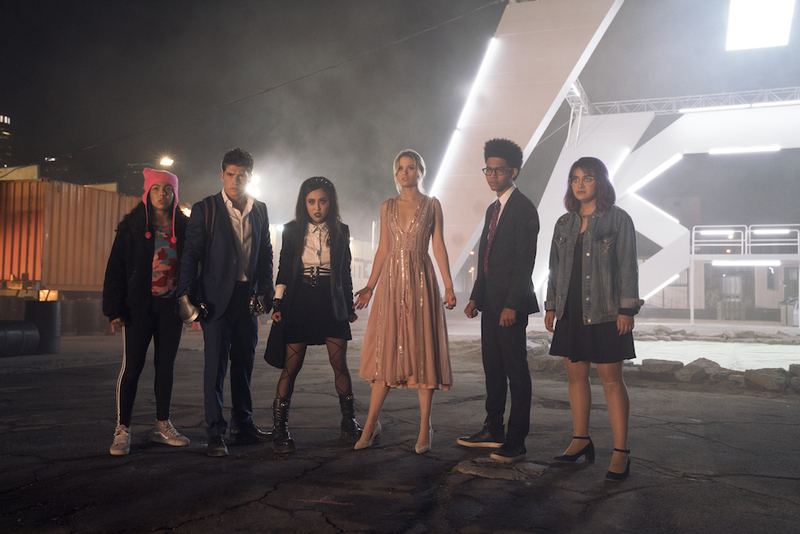 At a roundtable interview with the creative players of Marvel's Runaways, the cast members and executive producers described the characters' hardships of growing up in their extraordinary circumstances. 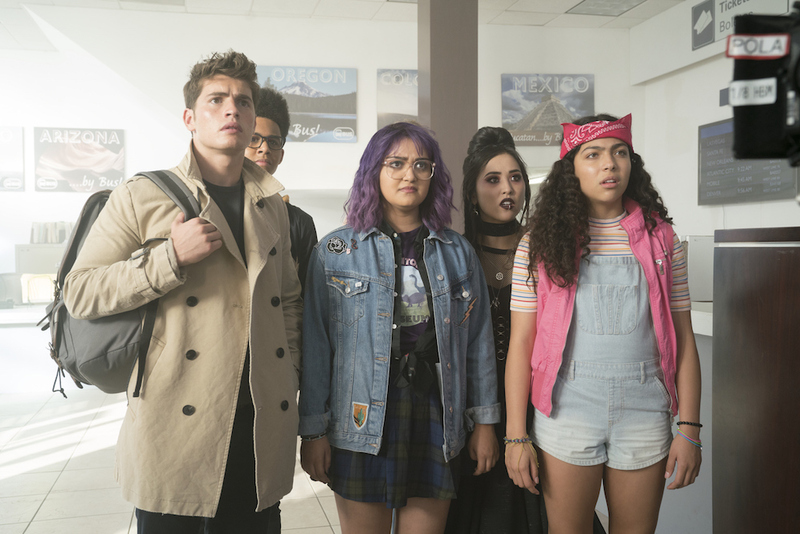 That isn't to say that these Runaways haven't grown during the course of the Hulu show's first season—Gregg Sulkin, who plays the show's "jock" and tech genius Chase Stein, discussed his dual identity in season one, and how he's evolved from that in the second season. Despite familial pressure, Chase never really felt like a jock, says Sulkin: "It's relatable to society today where we're encouraged to put on a facade even though that might not be true to who we are." When asked if Chase will have any cool new gadgets, Sulkin only offered: "Um, Fistigons are awesome. There may be a couple of tweaks [to them]." Next, we sat with Ariela Barer, who portrays Gert Yorkes, perhaps one of the most socially and politically-minded we've seen in the Marvel Cinematic Universe. Gert is a character who was loudly vocal about her feminist ideals in the first character, even gaining a small following of people wearing modified Hillary Clinton 2016 shirts to say "I'm With Gert." Still, Gert begins to be self-aware of her socio-economic status as she witnesses those who aren't as privileged firsthand. 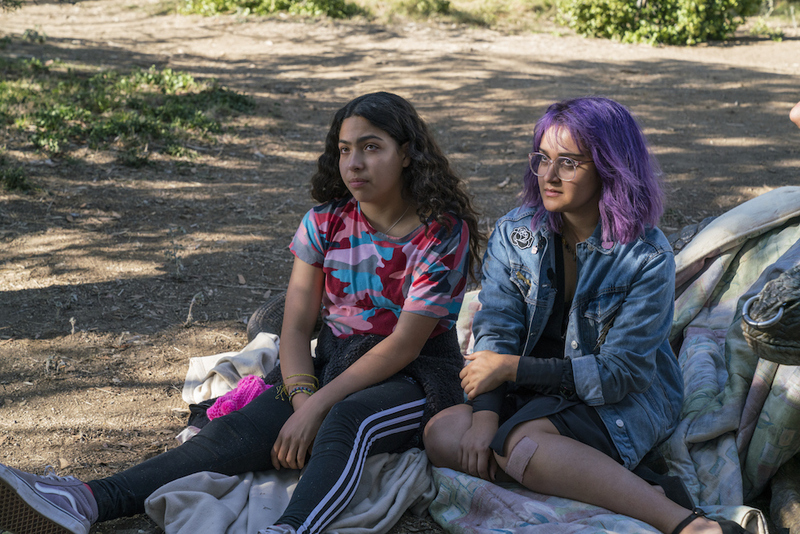 In season 2, Barer says, Gert serves as the "moral compass" of the group through this experience. Barer also discussed Gert's feminism, and how it compared to the character's depiction in the comics: "I think the experience of being a feminist in 2018 is a very different experience from being a feminist in 2002, and it definitely involves more anxiety and fear than it did in the past; so that's a modernization of feminism that Gert is bringing." I couldn't resist asking Virginia Gardner (Karolina Dean) some of the heavier questions of the day—with a lack of queer representation in the MCU, how did Gardner and actress Lyrica Okano (Nico Minoru) handle the first queer relationship between two superheroes in the MCU? The actresses and writers understood their responsibility and essentially treated it the same way as any other relationship. "I wasn't nervous about that as much as I was excited to be able to provide representation on a superhero show, [other ones] having not done enough." And with the show's fictional Church of Gibborim being so similar to Scientology, I was curious enough to ask Gardner if she had conducted any research about real-life cults. "I definitely had done some research on that, and also tried to get into the headspace of someone who is so enthralled in that," she offered, saying that season 2 will explore the "depth of how dark that church actually is." Molly Hernandez (Allegra Acosta) is the youngest of the Runaways group and as a result, was probably the least-trusted one due to her perceived naivete in a "boy who cried wolf" way. Acosta quickly agreed with this metaphor, but enthusiastically told us that things are certainly different in season 2. As she tells us, "Molly naturally has something in her where she knows her way around, she knows how to handle this stuff on her own, she's ready to take on this superhero role. [The other Runaways] don't know it yet, but throughout the [second] season, you can see how Molly leads the group in certain areas; when they realize that she's gone, they have no idea what to do." She's the "glue" of the group, inspiring the others with her positivity, while she herself "grows up mentally and physically" through the new season. Alex Wilder (Rhenzy Feliz) may be the only Runaway without a special power or ability, but that hasn't stopped him from contributing. Feliz was hesitant to characterize Alex as the leader of the group, pointing at his head and instead emphasizing that Alex was trying to figure out how to use his brain to make the necessary contributions for his friends. I asked if Alex expresses any jealousy in season 2 as he watches his friends develop his powers, to which Feliz responded: "He knows how to help using his brain and making decisions and making the strategy behind it all." But he isn't too much of a leader in season 2. "I feel like if anyone become a leader, it would be Nico. ... Especially in the beginning, [the other characters] kind of put him down a bit." Poor, powerless Alex still has a ways to go. Co-creator Stephanie Savage has had her hands in the development of The O.C. and Gossip Girl, but according to Jeph Loeb, she wasn't too big a fan of comic books as co-creator Josh Schwartz (who was not present at NYCC). Instead, Savage relished at the opportunity to write more stories about youths. Combining superhero fiction and teen drama wasn't a tough balance, but rather a "fun balance." "Josh and I," Savage told us, "love to write for young characters, for teenage who really feel like the stakes of their experiences are life and death, and in this case [in Runaways], they really were, so that was fun and refreshing." Marvel Television was internally called "The O.C. of the Marvel universe" according to Loeb, with the company being lucky enough to actually score the people behind that show. And of course, I couldn't resist asking Jeph Loeb about potential references to the larger MCU in Runaways season 2, citing Cloak & Dagger and Luke Cage season 2 as shows that had some sort of symbiosis. But Loeb has heard all of this before: "You guys are always trying to get me in trouble," he comically griped. Without answering one way or the other, Loeb explained that kids in Los Angeles wouldn't be concerned with the goings-on in other parts of the world. "We aren't an Easter egg factory," he said, a phrase he later echoed in the panel later that day. Tangential questions about easter eggs aside, the conversations largely focused on character growth—these are young characters still in the process of growing up, but they begin season 2 at radically different headspaces as they did when the show first began. A common theme was that each character has grown more comfortable with the role they have carved up for themselves—which is essential, now out there in a less safe and crueler world, without their usual access to resources, money, and privileges. Season 2 of Marvel's Runaways will be out on Hulu on December 21. Check out our summary of the Runaways New York Comic-Con panel here.